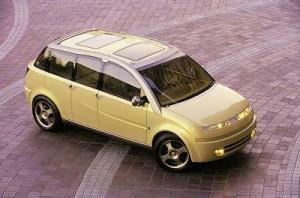 Saturn called the CV1 a multi-functional vehicle with a space efficient five plus two seating configuration. "The Saturn concept vehicle transcends traditional vehicle categories, incorporating characteristics of a sedan, minivan and sport-utility vehicle in an extremely efficient package," said Kate Zak, Saturn brand character design manager. At 177 inches in length, the CV1 was 1.1 inches shorter than the Saturn SL compact sedan. While its size made the CV1 easy to maneuver and park, the efficient and reconfigurable design provided maximum versatility to help meet the daily, changing needs of customers. The five plus two seating configuration enabled a customer to transport up to five adults and two children. Alternately, when cargo carrying is the priority, all the seats except the driver's seat could be folded flat. The three-passenger rear seat moved rearward to provide additional legroom or forward to maximize cargo space. The split-bench rear seat and the front passenger seat also folded flat to provide an impressive 85 cubic feet of cargo-carrying capability. The CV1 concept was powered by a 2.2L four-cylinder engine. Click here for more photos of the CV1.